• Northern basinal area: A relatively stable platform area, part of the Sundaland Continent, with N-S trending rift basins offshore and adjacent onshore, filled with Eocene-Oligocene non-marine clastics, overlain by Miocene and younger shallow shelf deposits. • Modern Volcanic Arc: Active andesitic volcanism related to subduction of Indian Oceanic Plate below Sundaland Continent (Gede-Panggrango, Salak, Halimun, etc., volcanoes). • Southern slope regional uplift: mainly Eocene-Miocene sediments, including volcanic rocks belonging to the Old Andesite Formation. Structurally complex, N-S trending block faults, E-W trending thrust faults and anticlines and possible wrench tectonism. South-West Java contains a number of sedimentary basins that formed within the axial ridge and in the area between the volcanic arc and submerged accretionary prism associated with the northward subduction of the Indian Oceanic Plate. • Banten Block: The most western part of Java Island which may be subdivided into Seribu Carbonate Platform in the north, Rangkas Bitung sedimentary sub-basin, and Bayah High in the south. In the west there are minor low and highs so called Ujung Kulon and Honje High, and Ujung Kulon and West Malingping Low (Lemigas, 1975; Keetley et al, 1997). The Northern offshore and adjacent onshore basinal area comprises two major basins so called North West Java Basin and Sunda-Asri Basinal area . The northern part of this area is dominated by extensional faulting with very minimum compressional structuring. The basins were dominated by rift related fault which contain several depocentres. In the NW Java Basin the main depocentres are called the Arjuna Basin North, Central and South and the Jatibarang Sub-basin. The depocentres are dominantly filled with Tertiary sequence with thickness in excess of 5,500 meters. The significant structures observed in the northern basinal area consist of various type of high trend area associated with faulted anticline and horst block, folding on the downthrown side of the major faults, keystone folding and drape over basement highs. Rotational fault blocks were also observed in several areas. The compressional structuring were only observed in the early NW-SE rift faults. These faults were reactivated during Oligocene time forming several series of downthrown structure associated with transpresional faulting in the Sunda area. Although the Northwest Java basin area is currently positioned in a back arc setting, the West Java Sea rift systems did not form as back-arc basins. Extension direction fault patterns and basin orientation of the Northwest Java basins suggest that the sub-basinal areas are pull-apart basins at the southern terminus of a large, regional, dextral strike-slip system; i.e. the Malacca and Semangko fault zones propagating down to the west flank of the Sunda craton. Through both Eocene-Oligocene rift phases, the primary extension directions were NE-SW to E-W.
Two observations support the interpretations that these basins are not back-arc related; 1) the extension direction for the WJS rifts is nearly perpendicular to the present subduction zone, 2) a thick continental crust is involved (Hamilton, 1979). The NW Java depression is asymmetrical, with its deepest Arjuna Sub-basin lies at the foot of the Arjuna Plateau, separated by a major N-S trending fault. The basin opens southward into the onshore Ciputat, Pasir Putih and Jatibarang Sub-basins, separated by the Rengasdengklok and Kandanghaur – Gantar Highs, respectively. The sub-basins are characterised by the presence of alternating highs and lows bounded by extensional deep-seated faults which were active during sedimentation. The Jatibarang Sub-basin is bounded by the Kandanghaur - Gantar- horst-block to the west, and the Cirebon fault, east and north-eastwards. This major growth-fault is responsible for an important accumulation of Tertiary rocks including the Jatibarang volcanics, in the Jatibarang Sub-basin. The Vera Sub-basin is a deep Mesozoic and Tertiary depression NE of Arjuna Sub-basin. This sub-basin is bounded by some major faults, especially to the south. The structures orientation is SW and SSW, similar to the direction of the Billiton Basin where Mesozoic (?) sediments are also known. The Sunda-Asri basinal area consists of Sunda and Asri basin. This structural element is the westernmost basin of the northern basinal area of West Java. The Sunda Basin is a roughly northsouth depression with its main depocenter, the Seribu half graben, at its eastern edge, separated from the Seribu platform by steep flexures and faults. To the west, the basin is bounded by the Lampung High, to the south by the Honje High and to the north the Xenia arch separates the Sunda Basin from the Asri Basin. 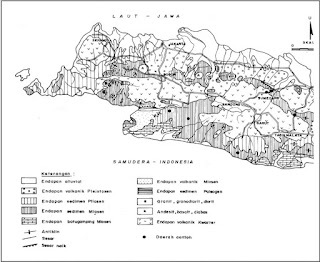 The Sunda Basin is the deepest basin in the northern basinal area of Java, where the basement is more than 3.8 second TWT, in the downthrown block of the Sunda/Seribu fault. A series of normal faults dissect the area in small horst and graben features. The Asri Basin, located to the northeast of the Sunda Basin, is the second deep basin in the region with basement as deep as 3.0 sec. TWT. It is limited from the Sunda platform eastwards by a major normal fault. To the northwards and westwards, it is bordered by steep gradients and is dissected by normal faults. The sediments of the West Java Sea basins are grouped into two very distinct sedimentary units which are the rift related sediment fills dominated by non marine/continental sedimentary sequences and the post-rift (sag) basin fills dominated by marginal marine and marine sedimentary sequences. In the following discussion, the sediment sequences are divided into five different tectonostratigraphic units based on their tectonic origins (Kohar et al, 1996). 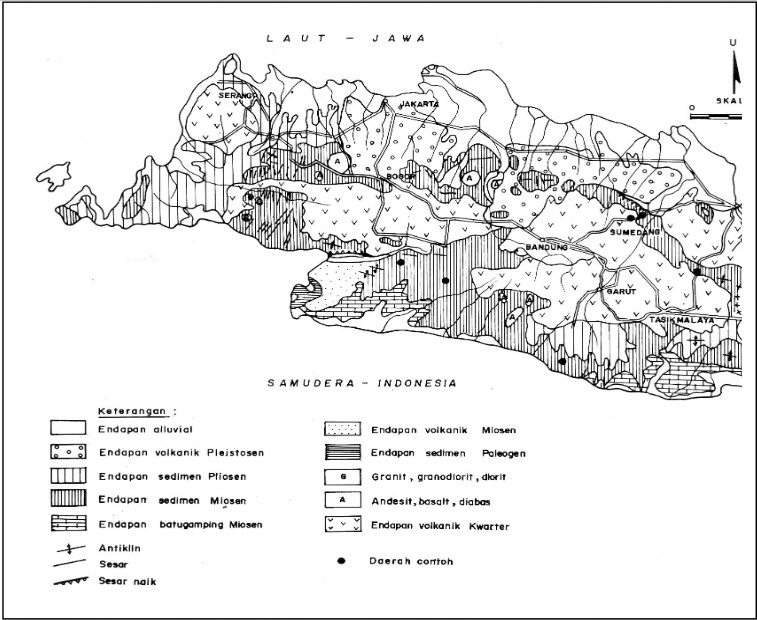 The sedimentary sequence of the North West Java Sea basins rests on a multi-complexes of a Pre-Tertiary basement representing the continental crest of the Sundaland. The basement assemblage is composed of metamorphic and igneous rocks primarily of Cretaceous and old ages and subordinate limestone and clastic sediments of possible Early Tertiary age. This melange of low-grade meta-sedimentary, igneous, and meta-igneous rocks is the result of subduction-related accretionary processes associated with the Meratus Suture which was active during the Cretaceous and Paleocene. Metamorphic grade varies widely throughout the sub-basins indurated limestones to low grade metamorphic philites. Based on basement dating, regional metamorphism ended during the Late Cretaceous, while deformation, uplift, erosion and cooling continued into the Paleocene. Late Cretaceous to Paleogene calc-alkalic magmatism occurred throughout onshore and offshore Java due to normal subduction related processes. Andesitic magmatism continued into the early Eocene. Another important igneous event in the West Java Basin, was a Pliocene phase of alkali basalt magmatism which is preserved as either sills or dikes or as volcanic edifices. Based upon the deep going, mostly extensional-fault series, the basinal area could be divided into alternating graben-like sub-basin and positive ridge or platforms. The early rift fills include the Banuwati Formation in the Sunda Basin and the Jatibarang Formation in the Arjuna Sub-basin. Continental and lacustrine systems dominated these sequences. The early rift fills are typically composed of immature clastics ranging from alluvial fanglomerate and conglomeratic sandstones to fluviatile sandstones and shales, culminated by anoxic lacustrine shales deposition in the Sunda Basin. Further east, in the Arjuna Sub-basin, the sequence is represented by alternating volcanic clastics and lacustrine clastics composed of andesitic volcaniclastics flow and tuff mixed with basement derived sediments (Gresko et. al.,1995). The early rift fills overlie basement and present in most of the deepest part of the Sunda, Asri and Arjuna Sub-basins. The alluvial fan facies which composed mainly of conglomerates, coarse to medium grained sandstones associated with basin margin fault. Its thickness ranges from 200 m to 30 m in a distance of 3 miles and until finally shales out to the south. It is interpreted that the alluvial fan deposition associated with a NW-SE trending basin margin fault, forms the early rift fill sediments, and progrades into a possible lake environment further south. The fluviatile sandstones and shales facies which onlap the alluvial fan facies. The fluviatile sandstones is interpreted as an axial channel fill if they are associated with alluvial fan and as a braided alluvial plain deposition on the western flank of the early rift graben (hanging wall fill). The third facies is transgressive deep lacustrine facies composed of black shales which covers the entire Banuwati area in the Sunda and Asri basins. Unconformably overlying the early rift fills is a thick syn-rift fill unit represented by the Talangakar Formation in the west and lower Cibulakan/Talangakar Formation in the east. This unit is present throughout the Nort East Java Basin, filling the series of half grabens of the West Java Sea Basin. The Talangakar is divided into two members, the lower member of Zelda member and the upper member so called Gita member. The syn-rift fills include only the Zelda Member and are of economic importance as primary oil reservoirs in major oil fields (Cinta, Widuri, Zelda, BZZ) in the Sunda, Asri and Arjuna basins. The sequence is Oligocene to Early Miocene in age and dominated by non marine sediments composed of interbedded fluviatile sandstones, shales and coals. Overbank mudstones and occasionally shallow lacustrine mudstones fill the interchannel area. In the Arjuna area coals, limestones and marine shales are also present in the upper part of the syn-rift unit. The coal and carbonaceous mudstones have been typed as the main hydrocarbon source rock for the Arjuna crude (Gresko et. al., 1995, Sukamto et. al., 1995). Maximum thickness of this unit is 2000 m in Seribu Deep Basin and Asri Basin. Age determination is problematic in the syn-rift fill unit as diagnostic pollen and fossils are absent. The age determination was based on the overlying post-rift unit (Upper Talangakar) and the underlying Banuwati lacustrine unit and a thought that this unit has an Oligocene to Early Miocene age. The early sag basin fills represent the overall transgressive setting in the Java Sea area related to the sea level rise during Early Miocene time. At this time the basin boundaries between the sub basins (Sunda, Asri, Hera and Arjuna) were not clearly defined. Basin bounding faults perhaps, were still active locally but subsidence had decreased significantly and rifting had ceased. Consequently, accommodation space was not entirely controlled by the movement of the faults for these post-rift sag successions. The overall depocentre shows a relatively symmetrical, work shape basin throughout the West Java Sea area. Non depositions continue to occur on paleohighs until Baturaja carbonate deposition commenced during Middle Miocene time, forming a bald area for the marginal marine deposition of the early syn-rift fills. The early sag basin fills (post-rift) include the previously described as Upper Talangakar (Gita and marine Talangakar Formation) and the carbonates of the Baturaja Formation and conformably overlie the syn-rift fills throughout the basin. The lithology in the early sag basin fills is composed of interbedded sandstones, siltstones, mudstones and coal, and marine shales overlain by a continue succession of platform to reefal carbonates (Baturaja). The sandstones and reefal carbonates of the early sag basin fill unit contain importance hydrocarbon reservoirs for most of the oil and gas fields in the area. The non marine clastics are dominated by channel, point bar and marine bar sandstones deposited in a wide range of environments from low sinuosity channel on alluvial plain, distributary channel to marginal marine bars. Coals and overbank mudstones and siltstones filled the interchannel area, form an intraformational seal for the prolific fluvial sandstones of the early sag fills unit. As transgressive process continues fluviatile and deltaic sandstones, coals and non marine shales deposition ceased, marine environment gradually advanced onto the highs. Reefal carbonates grew on basement highs (i.e. Krisna, Bima, Rama) forming a fringing reef complex around the highs. The main sag basin fills is dominated by shallow marine (neritic) to nearshore and deltaic facies include the Gumai, Air Benakat and Parigi Formation in the SE Sumatra area and most of the Upper Cibulakan Formation and Parigi Formation in the Northwest Java Basin. During middle Miocene to Late Miocene the overall West Java Sea area were connected forming large sag basin. The lower part of the main sag fills occasionally onlaps the basin flank but by the end of Late Miocene shallow marine deposition covered the West Java Sea area. In the Sunda-Asri area the main sag basin fills are dominated by shallow marine clastics consisting of marine mudstones, calcareous and glauconitic sandstones and thin limestone stringers. The sequence is culminated by extensive platform carbonate deposition with some local carbonate build-up (reef) within the Air Benakat limestones. The Gumai-Air Benakat Formation sandstones are 10 to 70 feet thick and interbedded with shallow marine mudstones, they typically show a coarsening upward sequences. Locally, carbonate build-up also developed in the southern basin margin area. In the Rengasdengklok High/Seribu Shelf near the Northwest Java coastal area a series of thick reefal carbonates (Mid-Main carbonate) developed on a roughly N-S trending parallel to the regional basement fault blocks of the area. The carbonate build up consists of skeletal wackestone and packstone with the main grain constituents are corals, benthonic forminifera, bivalves, echinoderm fragments, red algae and minor quartz and glauconite grains. The age of this carbonate build up is thought to be Middle Miocene (NN5-NN9 age). Shallow marine carbonate sedimentation continued of reefal build-ups in the upper part of the main sag basin fills, previously called the Pre-Parigi and Parigi Formation Shallow marine mudstones, shales and glauconitic sandstones filled the inter-reef and open marine area. The distribution of the Pre-Parigi and Parigi build-ups shows a N-S and NW-SE elongation, these build-ups commonly grew on a basement high or on an underlying Baturaja build-up which caused only a slight topographic elevations. The carbonate build-up comprises a combination of skeletal packstone, wackestone, and grainstone interbedded with mudstone lithofacies. On seismic section the geometry and distribution of these build-ups were clearly identified as well defined sub-elliptical build-ups. Late sag basin fills represent the latest sedimentary sequence below the present day sedimentation of the West Java Sea area that include the Cisubuh Formation. In the west, the late sag basin fills composed of marine claystone and mudstone and culminated in the continental deposits of conglomerate and volcanic clastic sediments. The continental deposition occurred during the sea level low of the Pleistocene time, approximately 1.5 Ma ago, when the Sumatra and Java Islands were part of the main Sundaland to the north. Sandstones and conglomeratic sandstones interpreted as fluvitile sandstones and volcanic clastic are the main lithology of the Cisubuh continental. To the east, in the Arjuna basinal area, this unit is composed entirely of marine claystone and mudstone with thin sand stringers. Shallow marine deposition continued in the south eastern part of the Sundaland covering the western part of the North West Java Basin. To the South of the northern basinal area, the north-south orientation of the structures, sub-basins and high is overprinted by an east-west feature of the Bogor Trough where the influences of the volcano-magmatic and its compressional effect are primordial. The entire Bogor Trough is a thrust-fold belt and towards the north, the system is progressively younger in age, starting from Lower Miocene in the south to Plio-Pleistocene in the north. All sediments supplied from the North are shaling out here. Volcaniclastics were brought from the South. The Bogor Trough extends eastwards to the northern East Java region. The Bogor Sedimentary Province is filled by 3 systems of sedimentation including the Ciletuh, Bayah and Jatibarang Formations. The mostly Middle to Late Eocene Ciletuh Formation (1400m) lies on top of a Late Cretaceous to Paleocene (possibly earliest Eocene?) subduction complex composed of mostly dismembered Pre- Tertiary oceanic crust and other rock units. Lower slope turbidites consisting of alternations of both volcaniclastics and conglomerates with fewer intercalations of volcanic and polymict breccia and claystone characterize the Ciletuh deposits. The second system consists of the transitional to shallow marine quartzose sandstones of the Bayah Formation which are also believed to be mainly Middle to Late Eocene in age. Intercalations of claystone and lignite are common. Marine sediments belonging to the Oligocene Batuasih Formation unconformably overlie this unit. These consists of marls, black claystones and shales which partly interfinger with the Oligo-Miocene Rajamandala Formation reefa1 limestones (90m). These are often thought of as equivalents of the Batu Raja Limestone. The third sedimentary system is characterized by volcanic sediment gravity flows. The lowermost of these is the Early Miocene Jampang Formation, consisting of breccias and tuffs up to 1000m thick. The name ”Old Andesite” is frequently used for this unit. Correlative with the Jampang and located further to the north is the Citarum Formation, consisting of tuffs and greywackes up to 1250m thick. These two formations are believed to represent contemporaneous components of the same deep marine fan system, where the Jampang Formation corresponds with the proximal fan deposits, and the Citarum Formation, the distal fan deposits. The Jampang is overlain by the Bojonglopang Formation limestone. In the northern areas of the Bogor Basin the Citarum is overlain by the Middle Miocene Saguling Formation which consists of breccias up to 1500m thick. This is overlain by claystones and greywackes of the Upper Miocene Bantargadung Formation (600m) which is followed by the gravity flow breccias of the Late Miocene Cantayan Formation. The sediments within the first and second systems were derived from the north, while the third system was derived from the south. (Schiller, 1993). The modern volcanic arc is an active andesitic volcanism related to subduction of Indian Ocanic Plate below Sundaland Continent (Gede-Pangrango, Salak, Halimun, etc., volcanoes). Results of previous work in West Java suggest the occurrence of volcanic producs of Late Tertiary magmatic activity; for example Pertamina (1988) recorded a K-Ar age of 12.0+ 0.1 Ma from a calc-alkaline pyroxene-andesite lava which represents part of the basement of the Quaternary Wayang Volcano. Pertamina (1988) study concluded those volcanic rocks in West Java range in age from 4.36+0.04 Ma to 2.62+0.03 Ma suggesting continuous magmatic activity during Pliocene time. The youngest age of volcanic rockwas obtainies from west of Pelabuhanratu (SW Java), where the K-Ar dating of the lava flow is 1.33+0.28 Ma (Soeria-Atmadja et al., 1994). The southern mountains, some 50 km wide, extend from Pelabahanratu Bay to Nusakambangan Island. These represent the southern flank of the Java synclinal structure, an uplifted crustal block dipping to the south. The oldest rocks in the southern mountains are schists, phyllites and quartzites into which have intruded ultrabasic rocks. These rocks, which are exposed in the southwestern corner of island (the Jampang), are covered uncomformably by the Ciletuh formation of conglomerates and sandstone of late Eocene to early Oligocene- age (Baumann et al., 1973). Unconformably, on the top of Ciletuh formation, is the Jampang formation of early Miocene age. The Gabon formation in the eastern part of western Java is similar to this Jampang formation. The Jampang formation consists primarily of volcanic sed1ments such as brecciaous marl and clay. The underlying Ciletuh formation has been intruded by quartz porphyry, which might have brought the ore of the Cibitung gold mines (Nishimura & Hehuwat, 1980). The Banten Block comprises several structural highs and lows . The Seribu Platform has a rather thin Tertiary section (1.5 sec. TWT) which consists of Baturaja and mostly post-Baturaja sediments, located in the north of the Banten Block. It is separated from the Sunda Basin in the west by the major Seribu fault system, and gently plunges eastwards and northwards into the Arjuna Sub-basin and to the North Seribu basinal area, respectively. The later is a narrow deeper area affected by NS and NW-SE growth faults. Gentle drape over large basement high areas and reefal buildups are the main structures of the platform itself. Its onshore prolongation is known as the Tangerang High, which is separated from the Ciputat Sub-basin by a major NNW-SSE trending fault. The Bayah and Honje Highs are Tertiary structural highs located on the south coast of West Java, Indonesia, situated at the margin of the Malingping Low, the western extension of the Bogor Trough. The Honje High comprises mainly Miocene volcanoclastics flanked by Pliocene sediments to the west and Eocene strata to the east. Together with the adjacent Sunda Strait strike-slip basin, it probably formed in response to movement along the Sumatra strike-slip fault. In the Sunda Strait and east and west of the Honje horst structure, and north and south of west Java (Malod et al 1996) are a series of moderately dipping half grabens which trend N-S. These are clearly visible on seismic to the south, offshore of the Honje High. The Bayah High comprises large E-W trending anticlines cored by Eocene clean coarse-grained sandstones (Keetley et al, 1997). The Banten Sedimentary Province consists of 3 main cycles of sedimentation. The oldest part of the first system is dominated by Paleocene? volcanic and igneous rocks equivalent to the Jatibarang Formation. These are overlain unconformably by sha11ow marine to terrestrial deposits belonging to the mostly Eocene Bayah Formation. The lower portion consists of mostly black shales with some larger foram-rich limestone lenses which have been interpreted as pro delta deposits (at least 300 m thick). The upper portion of the Bayah Formation consists of quartzose sandstones and pebbly sandstones with thin coal lenses (maximum 110 cm thick). The tota1 thickness of this unit is approximately 800m. The second cycle unconformably overlies the Bayah Formation, and is comprised of volcanic breccias and sandstones with some claystone belonging to the Cicarucup Formation. These are interpreted as breccias deposited as the basal portion of an alluvial fan sequence. These are followed by the mostly Oligocene to Early Miocene limestones of the Cijengkol Formation which are often rich in larger benthonic forams. Sudden massive influx of volcanics from the south consisting of tuffs and breccias deposited by sediment gravity flows belong to the Miocene Cimapag Formation (about 1500m thick). The third cycle is entirely composed of shallow to transitional marine sediments which correspond with the Saraweh and Badui Formations (about 1000m thick). The youngest marine-influenced sediments are from the Middle Miocene Bojongmanik Formation which consists of claystones and sandstones with some lignite lenses. These are unconformably overlain by Pliocene sediments (Schiller, 1993). Belum ada Komentar untuk "REGIONAL GEOLOGY OF WEST JAVA"